Do Home Inspectors Go on the Roof? Why Do Home Inspectors Go on the Roof? It is stated that going on the roof is the best roof inspection method. What is inspected? Are there properties of a roof not seen from the ground? All these are good questions. It can be hard to understand why an inspection necessitates going on the roof when the roof can be plainly seen from the ground. Listed below are items inspected or looked for when the home inspector is able to go on the roof. Hail damage to roofing material cannot be seen from the ground. This is easily spotted from above. The integrity of flashing for the plumbing vents (see below photo). The integrity of chimney flashing. When walked on, the inspector can tell if the roof feels spongy; which can indicate roof sheathing is undersized. The condition of valleys in the roof. Able to detect if there are problems where the soffit intersects with the roof. Is able to better estimate the roof age. Skylights are often problematic. These are easily checked on the roof. 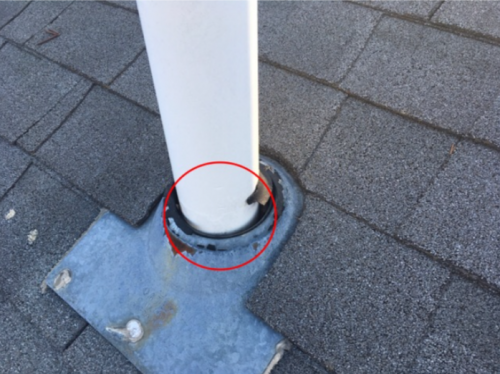 Plumbing vent flashing is missing rubber. When Do Home Inspectors Not Go on the Roof? Whenever possible, you will find a thorough home inspector on the roof of the house being inspected. Actually being on the roof is the only way to gather the most accurate assessment of the present condition. While drones are used occasionally as an inspecting mechanism, there are no substitutes for feet and eyes on the roof. 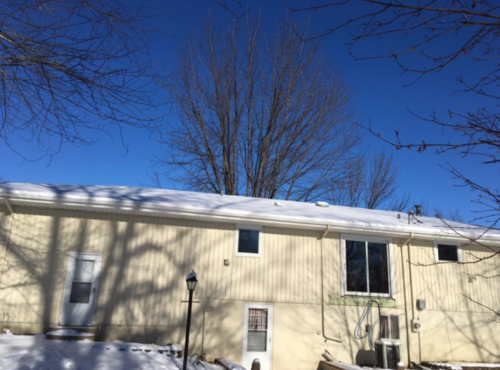 You may ask; “With winter coming, can I still expect the inspector to get on the roof?” There are exceptions when inspecting a roof from above is neither logical, reasonable or safe. Below are pictures and examples of when these instances are. Snow, ice, rain, and sleet can be hazardous enough while on the ground. No inspector will be on the roof in these conditions. Certain roofs may simply be too steep to allow for the inspector to safely be on the roof. When the pitch is greater than 8/12, it is too hazardous to attempt. Material types such as asbestos, slate, and tile can actually incur damage if the inspector would walk on them. Are you looking for the peace of mind with your new home purchase? Contact us today!